U.S. President Donald Trump's revised travel ban on citizens of six Muslim-majority countries will not reduce its impact on tourism, according to Taleb Rifai, the head of UN World Tourism Organization. "People don't go to places where they don't feel welcome," he added. Reports indicate that foreign travelers from many non-Muslim majority countries have also been met with hostility by US officials upon arrival in the United States. Hopper, an app which uses data to predict and analyze airfares, says that its research indicates that searches for flights to the US between January 26 and February 1 by internet users from 122 different countries dropped 17 per cent compared to the first three weeks in January, according to media reports. Trump's travel ban has already resulted in a worldwide 6.5 per cent drop in the number of airline bookings for travelers headed to the United States, according to Daily Mail. Meanwhile, New York City projects it will see 300,000 fewer international visitors in 2017 than it did in 2016, a 2.1% dip, according to a report in USA Today. It's the first time that group of travelers has shrunk since 2008, according to NYC and Company, New York's tourism arm. The US travel industry had nearly $250 billion in sales to foreigners in 2015 and had a $98 billion trade surplus, the most of any sector, according to MarketWatch. Without travel, the U.S. trade deficit would be about 20% larger, $600 billion instead of $500 billion. It seems that President Trump's policies are not only hurting America's image abroad but also contributing to potential job losses in travel and tourism industry that employs millions of Americans. Such policies are more likely to hurt than help the "working class white" Americans who voted for Mr. Trump. Great piece. How did the administration not anticipate this drop in travel? Interesting! Flew back from London last evening and the united flight was eerily empty! Not sure if it's off season or the Trump phenomenon! Mohsin H: "Interesting! Flew back from London last evening and the united flight was eerily empty! " Mr Trump needs medical attention. The U.S. Travel Association said recently the Trump administration’s immigration policies are hurting tourism. 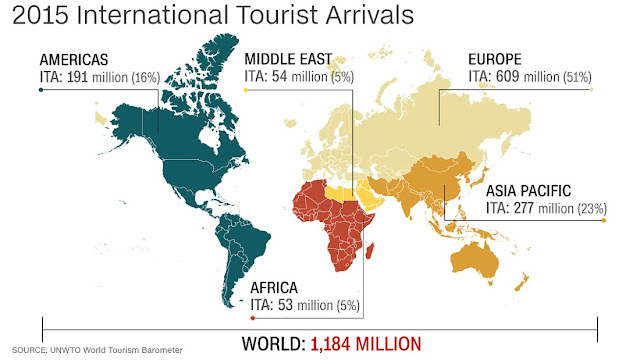 Tourism is an enormous sector of the U.S. economy, generating $2.1 trillion in economic output and supporting 15.1 million jobs, with international visitors a key component, according to data from the U.S. Travel Association. “Security is a top priority for the U.S. travel community, but it’s critical to balance both sides of the ledger: make clear who is not welcome, but also who remains welcome,” Dow said. A Jan. 30 op-ed piece in the Toronto Star newspaper encouraged Canadians to “boycott vacations to the U.S.” until Trump is no longer president. NYC & Company is launching a new campaign called “New York City – Welcoming the World” to try to counteract the expected downturn. The agency said in a press release that the campaign is intended to reassure international travelers who may feel deterred about traveling to the U.S. that they are welcome in New York. Last year wasn’t a fluke. The US has lost its appeal to international students. The US issued visas to less than 400,000 international students in fiscal year 2017. That’s a 17% decline from 2016, and a 40% drop from 2015. The decline in student visas issued makes it seem like there’s a dramatic decline in international students in the US. That’s a bit misleading. A US policy change in 2014 allowed Chinese nationals to renew student visas once every five years instead of every year. The result has been fewer annual applications from Chinese students, who make up about a third of the foreign-student population in the US. Enrollment figures give a clearer picture than do numbers of student visas issued—but the decline is there, too. According to a survey conducted by the Institute of International Education, enrollment of first-time international students fell an average of 7% in fall 2017 from a year ago across 522 US institutions. One contributing factor to the decline is the drop in Saudi Arabian students. The Saudi government cut funding for international-education scholarships in 2016 after a year of low oil prices, resulting in a 14% drop in the number of incoming students from the prior year. Saudi nationals were the fourth-largest group of foreign students in the US in 2017. Another factor: US universities are getting more expensive. Facing deep state budget cuts and legislative protection for local students, some major public universities increased tuition for international students to raise revenue. The current US political climate makes the situation even worse. A number of policies instituted by the Trump Administration, ostensibly aimed at protecting Americans, have barred international students from entering the country. A majority of US academic institutions cited visa issues as the top reason for enrolling fewer international students in fall 2017. As of March 2018, there were 0.5% fewer F-1 and M-1 visa holders–a measure for the number of foreign students enrolled in academic and vocational programs–in the US than a year ago. Though slight, it’s the first decline since the 2008 recession. The international demand for higher education hasn’t gone away. It moved elsewhere. Other English-speaking countries saw their numbers of international higher-ed students rise. More international students applied to universities in Canada, Ireland, Australia, and the UK—despite Brexit—in 2017 than in 2016. The US is the outlier.